According to OSHA, the major causes of injuries and fatalities involving aerial lifts are falls, collapses, tip-overs, and electrocutions; new safety standards are looking to inclinometers to lower risks. The use of aerial work platforms has risen steadily in recent years, and with a worldwide rental fleet of well over 1.1 million MEWPs (mobile elevating work platforms) one might expect to see a parallel rise in accidents and fatal injuries. However, the International Powered Access Federation (IPAF) released a study earlier this year that found the fatal injury rate has actually fallen from 4% to 3.5% since 2013. Although this data is encouraging, industry regulators continue to evaluate standards to improve MEWP safety and decrease the number of fatal accidents. At the IPAF Summit in Madrid, Chris Wraith, IPAF technical and safety executive, noted, “MEWPs are part of the solution in preventing falls from height, but we should recognize that MEWPs introduce hazards that need managing. Engineering control is but one option, and the industry is starting to work together on a global scale to ensure continual improvement”. In an effort to further reduce the risk of MEWP related injuries, IPAF has proposed a revision of ANSI safety standards and regulations. 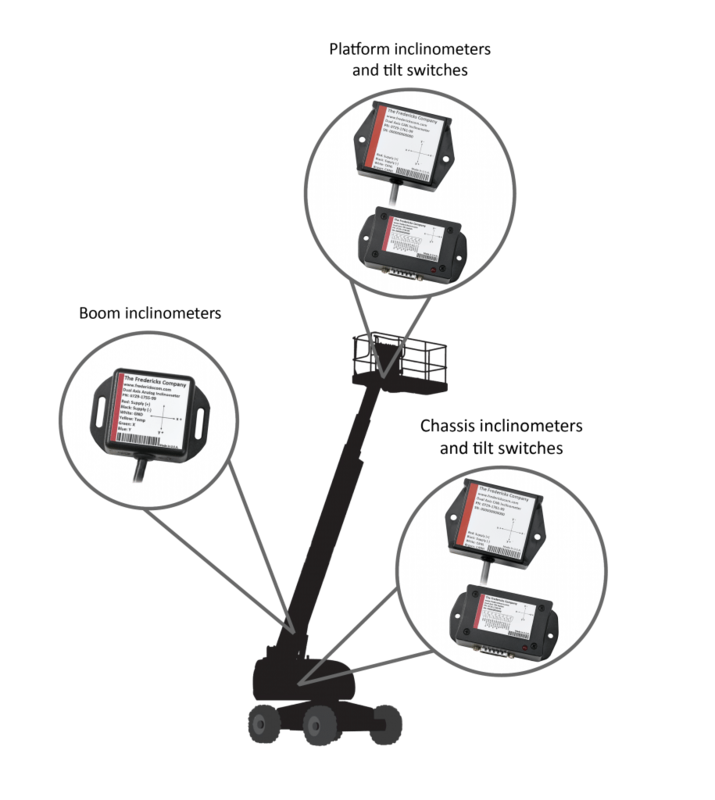 One of the biggest changes to come out of the proposed standards, which are expected to take effect in the second quarter of 2017, is the requirement for MEWPs to monitor work platform height. The mechanism behind this height sensing capability? An inclinometer. Essential to a variety of other construction applications, inclinometers and tilt switches have been keeping workers safe on the job for more than half a century. With a wide operating range and exceptional accuracy, devices such as Fredericks’ 0729-1736-99 Dual Axis Tilt Switch are ideal for measuring the angular movement of industrial machinery such as MEWPs. This tilt switch includes a core TrueTilt™ sensing element and electronics designed and manufactured by Fredericks at our Pennsylvania facility. It provides accurate and reliable tilt measurement for the chassis and/or platform of a MEWP and can be easily integrated into existing designs. Perhaps the most important metrics when it comes to MEWP safety are the accuracy and repeatability of the inclinometer. Poor sensor performance in these areas can be disastrous and lead to serious injury or death. When compared to other options such as MEMS devices, Fredericks’ electrolytic tilt sensors deliver repeatability of less than ±0.1°. In addition, Fredericks’ inclinometers and tilt switches are built to withstand the toughest conditions, featuring a wide operating temperature range with a minimum rating of IP67 for environmental protection. For more than 80 years, The Fredericks Company has specialized in tilt measurement products and sensors that set standards and promise precision, all designed and manufactured with pride at our facility in Huntingdon Valley, Pennsylvania. Today, our precise manufacturing processes produce the most accurate and advanced products on the market, ensuring perfection every time. A true specialty service provider, we are willing and eager to put our experience and capabilities to good use, helping OEMs achieve even the most complex designs.